When Do You Need Custom Rivets? While there may be a variety of different types of rivets available, that doesn't mean those rivets are ideal for your project requirements. When that is the case, custom rivets may be necessary in order to ensure that you meet project requirements. One of the best places to begin in designing custom rivets is size. This is because the rivet size is vital to ensuring that it will fit the relevant structure correctly. Rivets can be designed with an array of different types of heads. The head of the rivet may be designed to provide better security for the rivet, or could be used to prevent the rivet from being seen. How you choose to have the rivet head designed will usually depend on how the rivet will be used. It's also important to consider the material used when ordering a custom rivet. Based on the type of material selected for the rivet, different mechanical properties may be imparted to the rivet. A custom rivet manufacturer should be able to provide the option to have your rivet manufactured from a variety of different materials. 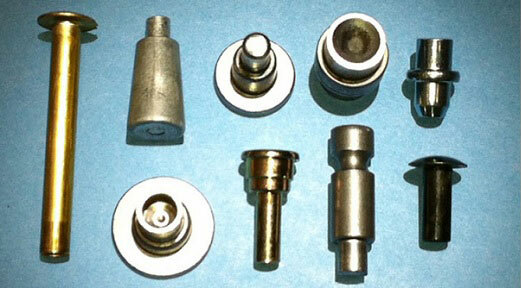 If you require a specific material for a customized rivet, it's important to ask in advance. At Universal Rivet, we are often able to accommodate special requests. The diameter and length of the rivet should also be considered. While every project is different, you will typically be required to drill holes into the metal prior to riveting. With this in mind, it's important to ensure that the rivet has the same diameter as the hole that is drilled. In relation to length, the custom rivet you order should also be sufficiently long enough for all of the materials involved in the project. It's important to make sure the rivet is not too long. If it is, security will be compromised. On the other hand, if the rivet is too short, it becomes impossible to lock it into place. Understanding what to consider when ordering a custom rivet can help ensure that your rivet is correct for your specific application.